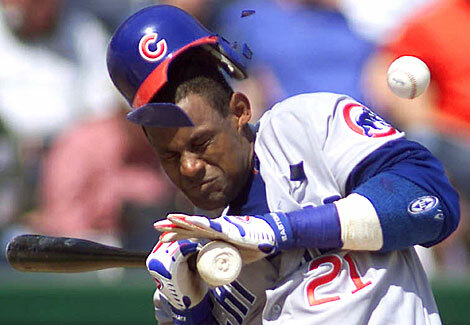 The Cubs' Sammy Sosa recoils as a pitch from the Pirates' Salomon Torres shatters his helmet in the fourth inning in Pittsburgh. Sosa left the game. Baseball has always scared the heck out of me. I'd rather catch a football over the middle against Ray Lewis than face Randy Johnson at the plate or try to catch a line drive up the middle. Classic "scared of the ball" kid and never grew out of it. What's amazing is Sosa didn't even get knocked down...he sorta stumbled back then knelt down... He went to the hospital for some cursory examination and came back to the clubhouse before the end of the game. In that photo, the ball is recoiling backward after hitting his helmet, by the way. Oh, I thought it was the energy field around the ball hitting him before the ball got there. Eh, if it was hockey he'd get some smelling salts on the bench and be back in there. Unless it's a friggin Swede!! were there any retaliatory pitches from the cubs? Yeah, his head was in the strikezone, not. Don't be ridiculous. The anti-armor argument is ludicrous. You've just seen the power of a wild fastball, and you're going to bring up the armor argument? If armor goes, then helmets should go too because they're just another form of armor. And yes, when Salomon Torres came up to bat, he was beaned in the knee. There should have been an ejection right there. BTW, do you see any armor on Sosa in that photo other than the helmet? I thought exact the same thing, and wanted to write a reply to Eugene, but you catched me first.. Ya, its been quite the wild week in MLB as far as people geting drilled. One game emptied the benches two times due to pitcher/hitter fights. I caught the Diamondbacks vs Cardinals fight where Batista threw the ball at Tino Martinez after Tino started charging...and he missed!!! He was about 2 feet away! No wonder the D'backs are in last place...they can't throw strikes! Anyone ever been killed at the plate? It's not really that far fetched, if not in the pros, in some local league. A girl died at an NHL game last year, hit with a puck. What would it take? Helmet slips a little, an off balance batter catches one in the temple. Batters almost always pick up the ball in time to react at least a little, but it's possible that a guy could lapse just enough to really get creamed. Ray Chapman was killed in 1920 by a pitch that cracked his skull. There has only been one player killed from a beaning during an MLB game. Ray Chapman roundabout 1920 or so. Back before they used helmets. Might have been before the rabbit ball as well which was introduced at about that time. I don't know but I would presume that the deadball was a bit heavier but also not quite as tightly wound so that it would give more on impact. Not sure aobut that the ball at all though. Kids die on occasion at other levels of baseball, both hitters and pitchers who get hit with batted balls. Not common but it happens every few years at least. Interestingly, of the 68 deaths, half were from getting hit in the head but the other half apparently were from getting struck in the chest. I would have presumed most deaths were from getting hit in the dome. Now that you mention the chest thing, that's right, I remember a case not too long ago about a kid getting hit in the chest and dying as a result, Aparently, that one is a real fluke, and the impact doesn't have to be very hard at all it just has to hit in the right spot during a specific point in the heart beat. Very rare, but not rare enough. I suppose but even at the risk of an ejection the Cubs pitcher had to retaliate. Hitting someone on the knee isn't anywhere near as serious as taking a fastball to the head. And with Sosa being the Cubs best player, their pitcher just had to stand up for his guys.